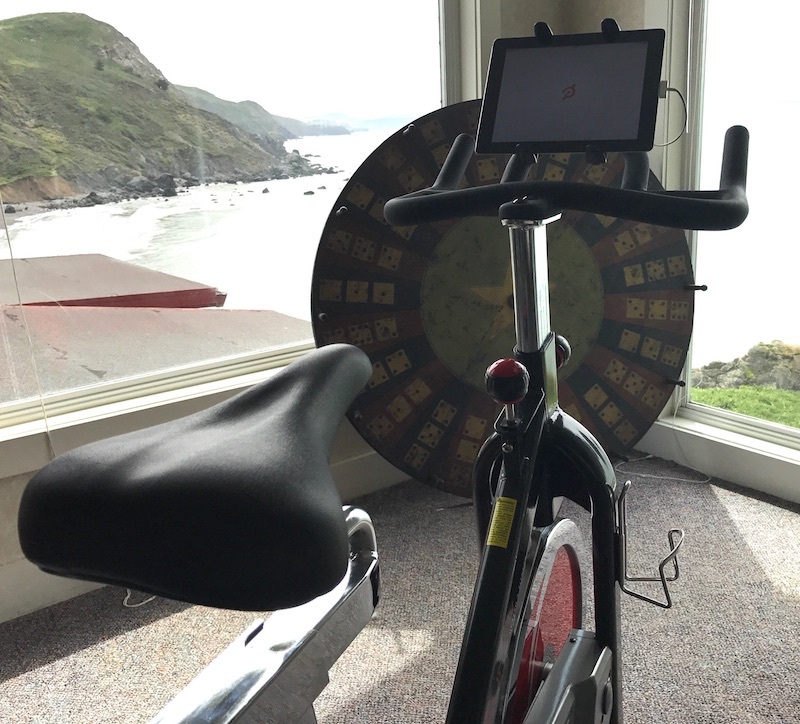 A year ago I decided to piece together my own Peloton-compatible stationary spinning cycle, I still love it. I never have to go to a gym full of PEOPLE. Long ago I discovered spin training as my off-day conditioning for marathon training. I loved spinning and now hate running with a passion. Last year, I really wanted a Peloton spinning cycle because Peloton lets you NOT LEAVE HOME when exercising. Peloton is basically a very expensive spinning bike with a big flat panel stuck on front of it. You may then stream live or recorded spin classes and participate in a group ride while not being in a room full of people. Genius! Their bike, however is very expensive and their streaming service is available via an iPad app. I had a spare iPad and set about picking a bike. The bike I settled on is a Sunny Health SFB-1002. With a 49lb flywheel and super solid frame the Sunny bike is rock solid. After nearly 12 months and around 150 45 minute or so rides, this bike is pretty much as new. After few months of use the bike developed a bit of a rhythmic clunk in higher cadences; a tiny bit of adjustment and all has been awesome ever since. The leather resistance pad doesn't even look worn in. Get a pad for the bike seat, your nether-region will thank you. The iPad holder has stayed in place and required very, very little adjusting. Much more stable and long lived than most motorcycle iPhone mounts. I guess that makes sense tho, I shake less than a 900c bike. I really, really like my Wahoo cadence and heart rate sensors. I added the heart rate sensor last year and will not ride without both. Luckily the cadence sensor is attached to the bike, and the heart rate sensor just uses a simple chest strap. With these sensors you get almost all of the data that a Peloton bike would supply you with. Instructors will call out cadences and effort levels. Cadence is a 1:1 match with Peloton. Effort level is usually referred to as a percentage of your 100% effort, so just feeling your ownself is a pretty good gauge, having the additional heart rate information also helps. There is a combo unit for heart rate and cadence. I have not tried it. Let me know if you do! I do find this electrode jelly helps get a better read on my ol' ticker. You could probably just lick the electrodes, but I like the jelly. Apply the jelly to the electrodes, do not lick jelly. I do not ride with Peloton every day. Sometimes I'll do my own interval rides, or a big hill climb, if I really know what I'm looking for. Most often I like to ride along with a pre-recorded class. The Soul music and 80s music rides are frequently just what I need, and I bounce between instructors. I've found a few who routinely encourage me to huge effort, and some I feel like give me a good workout. I actually prefer just the good workout and don't feel like I need to get out there and kill it. The simple fact that I'm riding this thing 3-4x a week makes a huge difference in my life. Riding the bike helps me with my pain management. A lot of stress and tension gets released just by hopping on the bike and getting lost in the ritual. I can actively feel my upper back, which is where I tend to carry the stress of work, loosen up a lot during a ride and stay 'better' for hours. If I am really regularly exercising I spent a lot less time in pain. Spinning is gentle on my disaster of a lower back, however. I have had to find a balance, it is not a 'the more I ride, the better I feel' situation and last May/June I over did it and took a few weeks off. When the lower back is speaking up I need to rest. The Peloton streaming service is worth the $13 a month. The instructors are great, they add variety to what would otherwise be super routine, and the $13 is enough to make me remember it is there and use it. If you want an at-home spinning solution for a lot less than a 'real' Peloton cycle, this is the way to go! Also, I am told I look great -- and it is not how you feel, it is how you look.